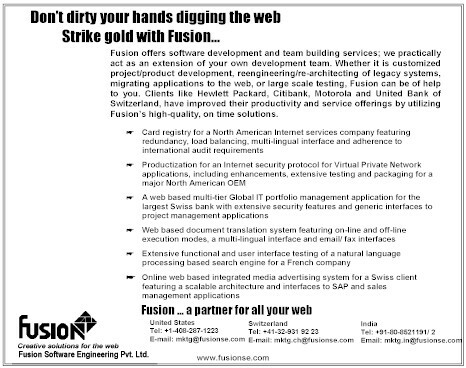 Fusion has been delivering internet related development services for over 3 years now. In the recent past, internet related work has become the single largest common factor of our projects. In just over a year's span, we have delivered over 7 projects with various specialized requirements in the internet market space alone. These projects have quite a spread from the technological viewpoint. Fusion delivered products and services to a variety of organizations that had internet needs like Financial services, Portfolio management, Advertising, Search engines, Language translation, Security/protocol implementation and Registry services. The efforts ranged from simple web-enabling to complex multi-tier client-server work or business process re-engineering and complete product/project development. The international clients were distributed as well; US, Canada, France, Germany and Switzerland. This has resulted in the obvious single minded focus of the company - particularly its marketing focus. We have been good at doing something and have kept a low profile about it, so far. Not cashing in, on our strengths. Especially when anyone and everyone want to be associated with lingos like e-commerce and '.com' projects. With high-technology development background, Fusion would stand apart from other internet players. It is obvious that market needs are very high in this segment and as in many other areas, 'the supply is less than the demand', as so many want to be doing business on the web, almost overnight. And the supply of good and specialized solution providers is really-really low. And thats where Fusion would position itself. With its offshore delivery model, we can be very competitive on huge projects.